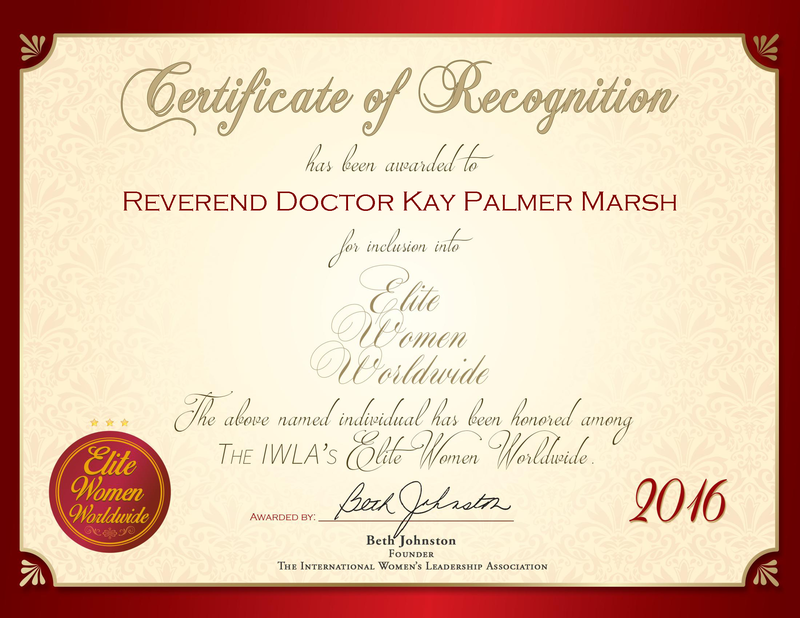 Longmont, CO, July 20, 2016, Kay Palmer Marsh, Reverend Doctor at Fort Lupton United Methodist Church, has been recognized by Elite Women Worldwide, for dedication, achievement and leadership in ministry. Rev. Dr. Palmer Marsh is honored for professional longevity as a pastor for more than 20 years. For more than two years, she has been at her current congregation, delivering services for ministries of all ages. In addition to being a pastor, she was appointed to the Urban Renewal Board of Fort Lupont, and is the president of the board for the Rocky Mountain Foundation of the United Methodist Church. She is also a board member of the Rocky Mountain Conference’s Board of Pensions and participates in the League of Women Voters of Boulder County. In her preaching, she endeavors to inspire others to be all that they can be and to live peacefully. Early in her career, Rev. Dr. Palmer Marsh worked as a social and political activist. She earned a Bachelor of Arts from the University of Illinois, Chicago and a Master of Arts in urban studies from Loyola University. She received a Doctor of Ministry and Master of Divinity from Denver’s Iliff School of Theology. She is preparing her book “Preaching Through Our Troubles” to be released in 2016. She is motivated to continue her work by seeing the positive results her speeches have had. She was distinguished for her outstanding efforts in leading people into a relationship with Jesus Christ with the Harry Denman Evangelism Award.